My grandmother was born on the eve of the Great Depression. She tells the story of the day the bank men came in their long coats and bowler hats to tell her mother that the loan was foreclosed and the family had to move out. My grandmother's mother had told her to play with her dolls there in the front room - grandmother thinks it was to make the bank men feel extra guilty. Everything turned out fine in the end. They found a large, upscale house to rent for less than a song (the owners were desperate for anything they could get) and the mother slowly saved up money and bought another house near the end of the 1930's. I wonder what sort of stories my kids will be telling their grandchildren. "Way back in the Great Recession of the two-thousand-teens we had to sell our i-pods to buy shoes." "Yup, and as our computers broke down pretty soon we only had one working computer in the whole house." "Wow, Grandpa! How did you survive it?" "I don't know. Mom and dad somehow managed to hang on to our internet service, but they did cancel the cable and satellite TV. The saddest day for me was the day we put our entire DVD collection up for sale on e-bay." We spent New Year's Eve playing board games with some friends. They asked what kind of music we wanted to listen to. I said, "I like traditional Celtic." They started up their computer and went to pandora.com and before I knew it I was listening to the Chieftains and friends to my heart's content. This morning I decided to open my own account with Pandora. It's an internet radio station with no DJ, just a huge catalog and an artificial intelligence that thinks it knows what you like. Unfortunately, this means that listening to music on Pandora can expose you to recordings that never should have happened. I told it I liked Rockappella, so my AI DJ played me The King's Singers' rendition of "And So It Goes." Words fail me. It just shouldn't have happened. Finally, FINALLY, after nearly three months, I cracked open my manuscript and read through chapter one. Eh, not bad, but it still needs some work. Especially now that I have some new ideas. Hee hee. My plan - to go through the manuscript slowly, marking it up for revision while creating a working outline. So far I have written two and 3/4 books in my life, and in every case I spend most of my first draft moodling around, learning about the characters and the world they live in. I have some idea of the plot, some of the time, but I'm so open to all options that pop into my imagination that the stories get scattered. Now it is time to FOCUS! I will find the best story threads I came up with and weave them together into a powerful plot that can pull the reader along through the prose. I thought I was smart. I thought that when I bought a house I would pay about three times our annual income. That used to be the rule, right? When the real estate agent showed us the only four-bedroom houses (we have five children) available in that price range (this was Las Vegas in 2004) I wanted to cry. We ended up paying over five times our annual income and had to get an interest-only ARM to do it. I didn't sleep well for two years until the pay-off penalty expired and we could refinance. Why did we have to do this? Because everyone else was doing it. The banks were loaning too much money to anyone who came along, and so since people could pay that much for a home they did it. Well, having survived that adventure, I thought I'd just keep being smart and stay out of any more trouble. We had a fixed rate mortgage and a good steady income, so I went about saving a little money when I could, never buying anything on credit, keeping my pantry well stocked, turning the thermostat to 62 in winter and 86 in summer, and avoiding unnecessary use of my gasoline powered vehicle. Now, as a direct result of the economic recession, my husband, who works for a state college, is being laid off due to budget cuts. Yes, I'm glad I did all those smart things because we're better prepared to be laid off. On the other hand, I can't help but think that we wouldn't be laid off right now if everyone else hadn't borrowed more money than they could pay back! From now on, it's not good enough for me to be smart. I have to convince other people to be smart too. Space Explorers Ready for Launch! I signed up to be a merit badge counselor for the "Space Exploration" merit badge at a big merit badge midway for the local Boy Scouts on Saturday morning. I'm going to show dozens of tween-aged boys how Newton's laws of motion operate, show them a video of the Messenger spacecraft's trajectory, discuss the International Space Station, tell them about the careers of some of my friends who work with the space program, and then in two weeks we're going to launch model rockets. Hey, how come the Girl Scouts never did stuff like this? I remember going camping and stringing beads and learning to dance the Cotton-Eyed Joe. I wanted to shoot BB guns and launch rockets. Maybe that's why the Good Lord sent me four sons. "Sealants are quick and easy," I told my six-year-old as we drove to the dentist. "They put a little something like glue on your tooth, and that keeps the plaque from making cavities. No cavities!" I cheered. "Sealants are great." When we got to the dentist I signed us in. "Did you have any questions?" the receptionist asked. "I had a billing question," I whipped out a statement I'd just got in the mail with an angry orange "SECOND NOTICE PLEASE PAY IMMEDIATELY" sticker on it. "I know my insurance sometimes doesn't cover all the x-rays, but I really thought they'd pay for the exam." The receptionist frowned at the statement, then at her computer screen. "Actually, we received full payment from your insurance company the same day this got mailed out," she told me. "You can disregard this." Way to give me a $213 heart attack. For a moment there I had thought we were eating rice and beans for the rest of the month. Happy to disregard the angry orange sticker, I sat down with a book while my children played with toys and watched the video on the big screen across the room. My six-year-old sat quietly next to me until the dental assistant called him back. "It will be about thirty minutes," the woman told me. Thirty minutes later, she came back. "He seems really frightened today. He won't open his mouth. We can try some laughing gas." That's when I remembered what I had said to my son on the way to the dentist. I had said the word glue. Dang, I bet he thinks they're going to glue his mouth shut. "We showed him everything we were going to do," the nurse seemed puzzled. "And he was so good for his filling last time." Just glue my foot in my mouth. After a few futile attempts to get my son to open up for the dentist, the man told me, "Doing sealants requires a high level of cooperation. We can try sedation or laughing gas, or we could try again some other time." "Some other time," I said. Some other time after we get our tax return. Once we got out in the car I gave my son a big hug, "I'm so sorry! Did you think they were going to glue your teeth together?" He nodded, his big blue eyes full of worry. "That was my fault. I shouldn't have said glue. Sealants are more like paint. They paint white on your tooth, and once the paint dries it is hard just like your tooth. You won't even notice that it's there. We'll try again some other time." "Okay." My son didn't look worried any more. "We can try again next week." "We can try again in the summer time," I said. "In the spring?" he attempted a compromise. "In July. That's when your next appointment is. And then you can get your sealants, and your teeth will be super strong." So the plumbers came at 2:00 today. Since they were only charging me $300 they probably thought the job would take them an hour, maybe two. I hoped so because I had a PTA meeting to attend at 3:30. The sawing and pounding began. A few minutes into the job I heard words that struck terror into this homeowner's heart. "It broke off, there at the bottom," the plumber's assistant said. "Do you have a torch?" I lurked near the bathroom door, folding laundry and listening to snatches of irritated conversation and the sounds of tools I hadn't thought they would need, like a torch and a Dremel. What if they had to get the jackhammer out and break into the slab? What if they had to rip off the whole wall? For a while I avoided eye contact as they went back and forth between their truck. At last I gave the senior plumber a questioning look. He pulled a straight smile and gave me a thumbs up. I hoped that meant that he wasn't going to charge me any more than the estimate. "We're going out to get another coupler," the plumber said a few minutes later. "We'll be right back." By the time they got back my older children were home from school, along with a friend each. "They're multiplying," the plumber remarked in surprise when he returned and saw all the kids. I wondered if he really thought that one three-year-old had strewn all the toys, papers, and junk all over the house. I didn't think I'd make it to the PTA meeting, so I called the secretary to let her know, and then sent the older kids and their friends out to fetch the younger ones from school. "We've got to get a few more couplers," the plumber said. "We'll come back." As if I thought they'd abandon me with an open waste pipe in my wall. They wouldn't do that, would they? My husband had come home by the time the plumbers returned. I introduced them, then started thinking about dinner. With all the commotion in the house I decided Kraft Macaroni and Cheese was all I could handle. "We need a few more parts," the plumber told me. "Be right back." All this time, of course, no one could use any of the plumbing upstairs. No sinks, no toilet. It would have flooded the downstairs bathroom with . . . you guessed it. When my six-year-old finished his homework I rewarded him with a bike ride together around the block. On our second time around I saw the plumbers' truck coming up the street. "We're almost ready to rock and roll," the head plumber said when he came back in the house. I guess that meant he thought he had everything he needed and they were almost finished. One of my children had to go to the bathroom. Instead of interrupting the plumbers I took him to the next door neighbor's house and asked to use theirs. I was beginning to feel that I ought to invite the plumbers to stay for dinner. Then again, it was only Kraft Macaroni and Cheese. At last, near six o-clock, the plumber asked my husband to turn on the water upstairs. No leaks! I applauded. "We hit a few snags, but you're good to go now. How would you like to pay?" I handed over my debit card. "I'm glad I didn't try to do that myself," I said. A brief, rueful chuckle from the plumber. Since I'm trying to get ready to sell the house I thought I'd get started on the downstairs bathroom. Step 1 - rip off the baseboard. Step 2 - hey, is that WATER IN THERE??? Step 3 - I got my hand saw and started cutting holes in the wall. Before long I found the culprit - a leaky joint in the waste pipe from the upstairs bathrooms. 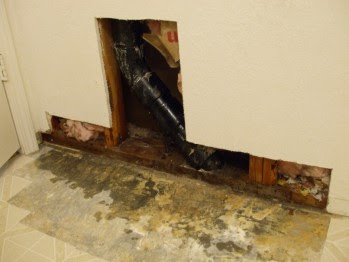 Maybe I overreacted, but I cut out every bit of the floor that had gotten damp, plus all the wall board that had any traces of mildew or water damage on the back. I was already going to re-do the floor, and I don't mind patching the wall because it used to bulge a little in that spot (hmm. . . I should have suspected something). This picture was taken just after I sprayed everything down with bleach solution. Today I'm getting estimates on the waste pipe repair. That's better, but still a bit disheartening when your husband was laid off from work last Friday and the free e-file tax return site can't seem to find your account. I've got one more estimate coming this evening, and then I'll probably schedule the work. In the mean time we're down to one bathroom - unless I want more sewage water dripping.